With spring seemingly here, Nick and I bouldered outside today. 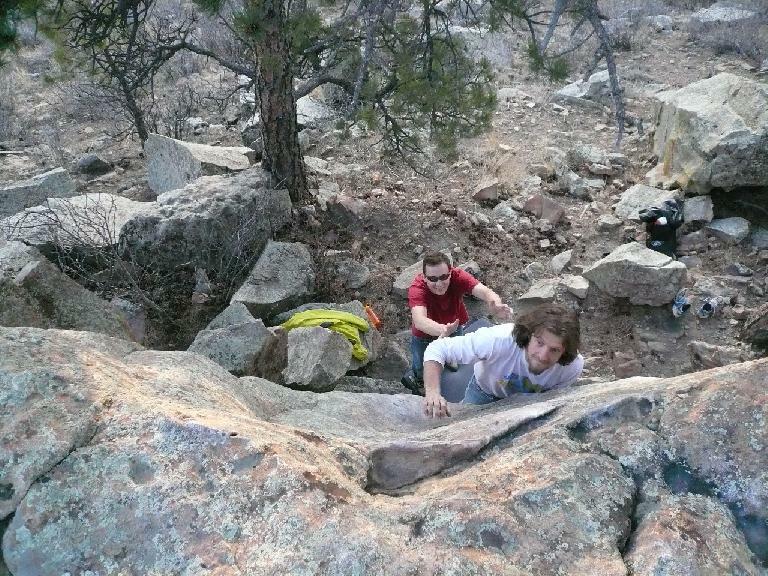 Notably, this was his first time rock climbing outside ever, and my first time on some real rock in Colorado. Indeed, the temperatures were hovering around 60, and this being northern Colorado, the sun was shining brightly. So in the afternoon, I threw my climbing shoes in a little knapsack, hopped on the Buell, motored over to Centennial Rd. 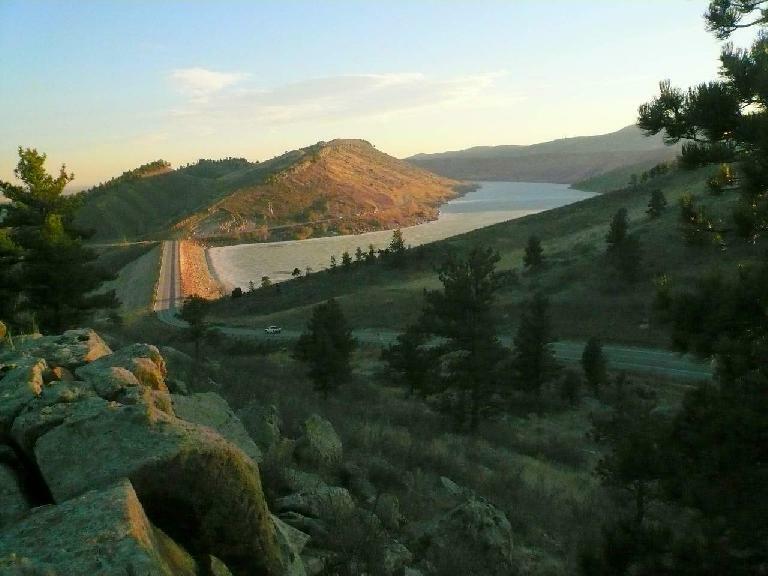 which is on a ridge overlooking the Horsetooth Reservoir (encountering exactly one traffic light the entire ride), and met up with Creighton and Nick at a little parking lot. From there, we headed about two miles further south along CR-23, and pulled off to another parking lot. (Here’s an interactive map of the spot.) East of the road and about 100 feet above us (if even that) was a neat row of rocks dotted with many tell-tale smudges of chalk. Ah, yes, here’s the bouldering. “Short approach!” I delightfully observed, noting that this was one of the few times in my life I did not have to hike in at least a mile or two to reach a climbing area. In fact, it took us no more than one or two minutes to reach this spot. 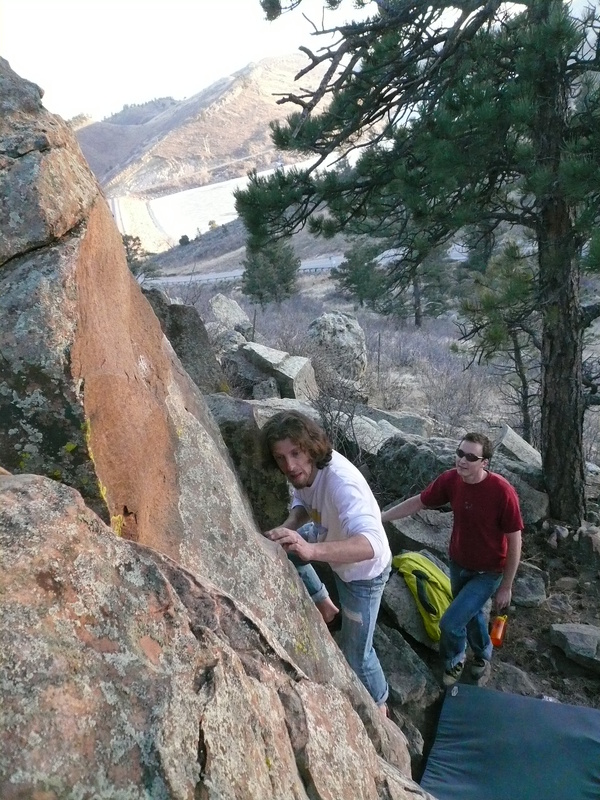 In the next 1.5 hours, Creighton showed us five or so different boulder problems (each on a different rock). We started out on a nine-foot high slab that took Creighton about 20 seconds to get up, but took me multiple tries to figure out. 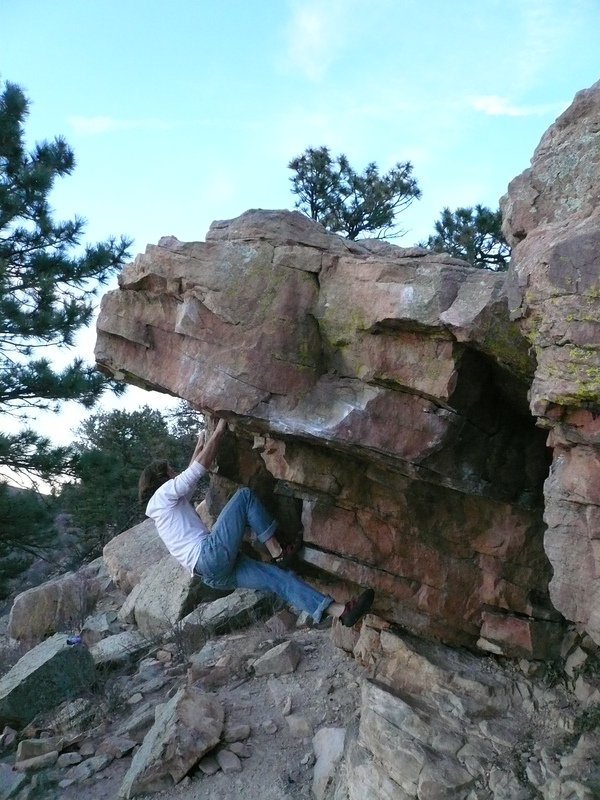 “The sad thing is,” Creighton observed, “is that despite being pretty hard, it is probably rated only a V0.” I agreed it was indeed humbling (since bouldering problems get up to V16 in difficulty! ), although in retrospect, I might have rated it a V1. 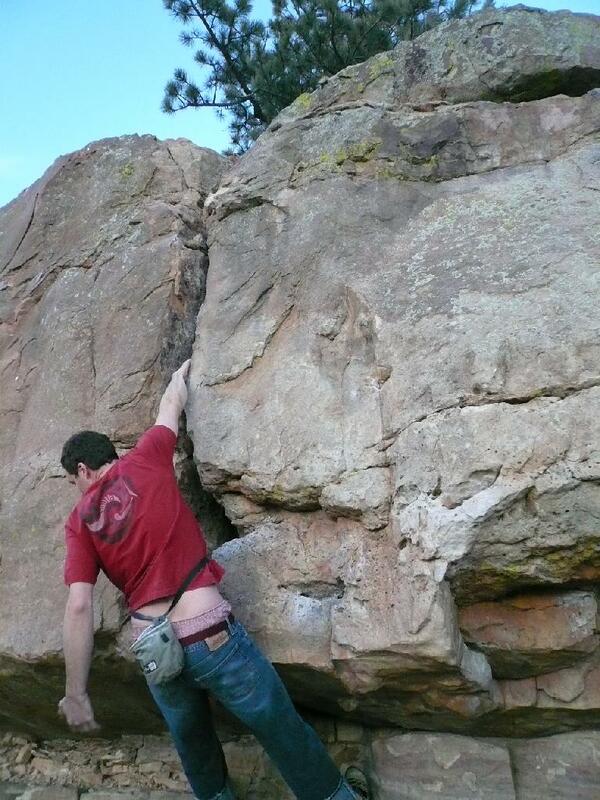 I had an easier time on the other problems, including a crack and a big overhang. We ended the day off with a traverse. We talked about other places to boulder and climb at, and there seems to be a lot. Places I need to check out and climb at include the Monastery, the Palace, Greyrock, Clear Creek [something], Sheldon (?) 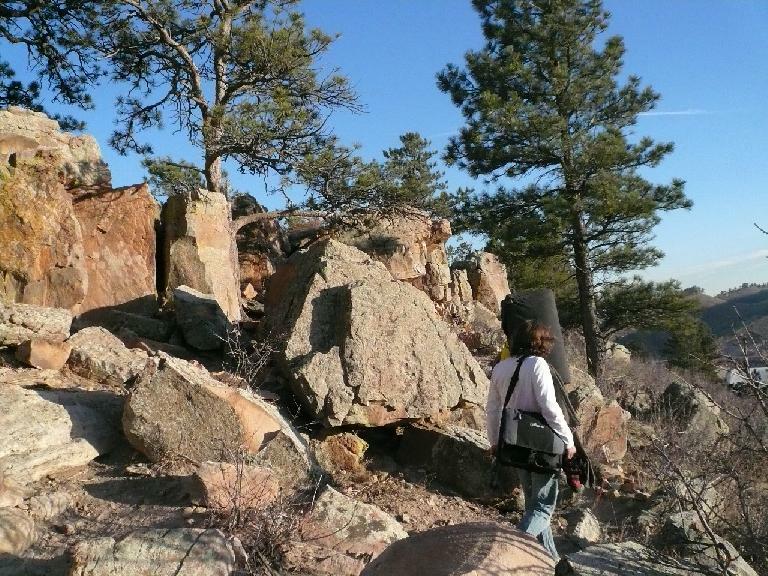 rock behind a hotel in Estes Park, and more local, Rotary Park. Next week we might try climbing (top-roping) right across the street on Duncan’s Ridge if the weather holds up. Hopefully the weather is as good as it has been the last few weeks! Tomorrow is supposed to get up to 73 (!) degrees—hopefully it is like that next weekend too. Of course, if not, there’s always the gym. Not a bad alternative, although bouldering today reminded me how nice it is to be climbing in the fresh air of the outdoors, enjoying the wonders of Mother Nature.